This is the follow-up to my first article about the current situation at the University of Amsterdam. Instead of writing about current developments this article uses a different perspective. 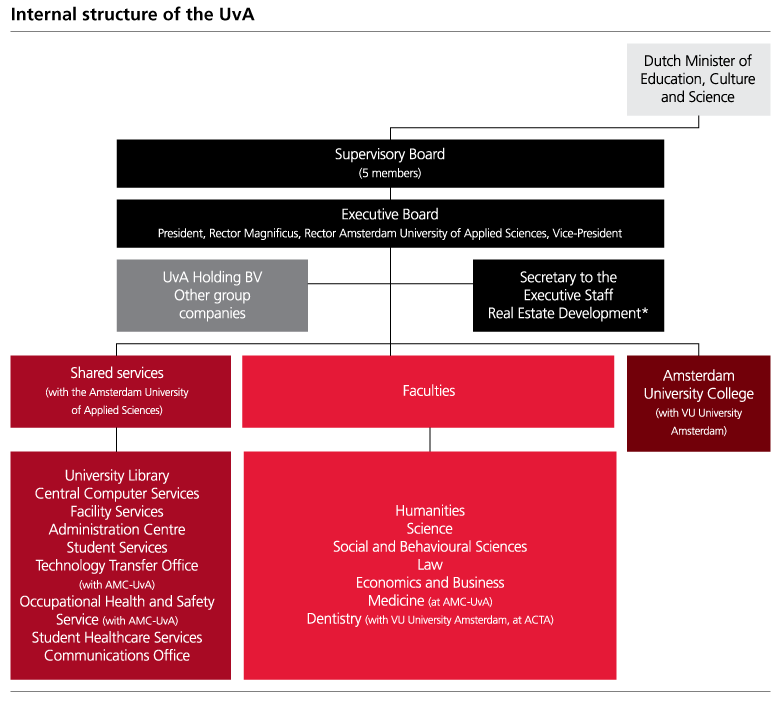 What you see here is the organisational chart of the University of Amsterdam, in short UvA. In business and management this chart is often more telling than how big and shiny the office looks. When you want to have an idea of what kind of organisation you are dealing with this chart is one of the most important sources of information. There are a certain aspects that are important to pay attention to. How vertical or horizontal is the organisational chart shaped? Very vertical indicates top-down management and very horizontal indicates more bottom up management. How many blocks or figures are present? The more the more complex the organisation “may” be. How many horizontal layers can you distinguish? The more horizontal layers the more hierarchical the organisation “may” be. Is everything clear and when necessary properly explained? If so that is a good sign. Is the organisational chart easy to read? If so that is a good sign. In annual reports it is a convention and necessity to explain the organisational chart further in an additional text part. This text part describes the division of tasks, responsibilities, interdependencies and unique organisational aspects of the organisation itself. From top to bottom, left to right I now guide you through this organisational chart. At the top of the chart there is the minister of education, culture and science. This member of the cabinet in The Hague manages the national education budget. Each year the schools and universities of the Netherlands receive an amount of money, the “lump sum” for the next year. The government does not own the universities, only subsidises, monitors and checks. When a school really does not meet the national standards for its category it can be closed by the government in extreme cases. Next there is the supervisory board. This board, as its title suggests supervises and can sometimes give the deciding vote in a decision. In each organisation the supervisory board can have organisation-specific tasks. Generally speaking the supervisory board looks at things like corporate social responsibility, salary levels, bonus levels and other important details. What follows is the executive board, in other words the board of directors or top managers. The people in this board are tasked and responsible for making the important decisions. The UvA’s executive board has four members and one is from the Hogeschool van Amsterdam, in short HvA. Organisationally speaking this means that the UvA and HvA are merged but from the outside you would think otherwise. Below the executive board there are two branches. To the left there is the UvA Holding B.V. and to the right there is the secretary to the executive staff tasked and responsible for assisting the executive board. Also to the right side there is the real estate group. This real estate group takes care of real estate projects for the UvA. This layer exposes an organisational issue that will always lead to dilemmas. Ideally an educational organisation that provides education and research is non-profit. By remaining non-profit there is no commercial bias to decisions and the receivers of education and research are always provided with what they need. The UvA is additionally a holding and a B.V. Holdings are profit organisations and “B.V.” means private limited liability company. To combine a non-profit organisation with an internal profit organisation leads to mixed interests. The UvA provides for students, teachers and researchers while also investing and giving the shareholders their returns on investment. When these mixed interests are out of balance one party will always be worse off. The next layer displays the UvA-HvA facilities for education and research. The HvA is referred to as the “Amsterdam university of applied sciences” which is educational self-promotion by giving yourself a grand sounding name. Consider the UvA and HvA merged in practice while keeping their old names for branding and identification. In the middle there is the overview of UvA-faculties. To the right there is the joint-venture with the Vrije Universiteit called the Amsterdam University College. A thorough read of the UvA-website and their 2013 annual report gives you a more in depth idea. If you are genuinely interested check them out for yourself. These weeks I have been keeping an eye on UvA and Maagdenhuis developments and more research will follow. The issue the students and some teachers now have is the matter of having a direct vote in certain decision-making processes that affect the entire UvA. This issue partially stems from the fact that the UvA is also a profit organisation. When the executive board listens more to its shareholders than to its students, the students become less important than university finances. I understand that money, or more specifically financial capital and profitability are important. I do not understand that an originally non-profit organisation has chosen to serve both students and shareholders. When there is no balance it is only a matter of time before things will go seriously wrong for all parties. Posted in Essays & Articles and tagged Amsterdam University College, annual reports, aspects, balance, business, decision-making process, division, executive board, government, hierarchical, horizontal, horizontal layer, HvA, information, interdependencies, lump sum, Maagdenhuis, management, minister of education, non-profit, organisational chart, perspective, profit, real estate group, responsibilities, shareholders, students, supervisory board, tasks, University of Amsterdam, UvA, UvA Holding B.V. secretary, vertical, Vrije Universiteit on March 12, 2015 by rura88.